Opis: The latest invader from Earth, the Mars Polar Lander (MPL) spacecraft, is scheduled to touch down on the Red Planet's surface on Friday, December 3rd. If all goes well the robotic explorer will open a parachute, deploy landing legs, fire thrusters, and come to rest amidst rolling plains of intriguing layered terrain near the Martian South Pole. In this orbital image, a grid overlays the landing region with the targeted site indicated by a purple oval about 200 kilometers long by 20 kilometers wide. 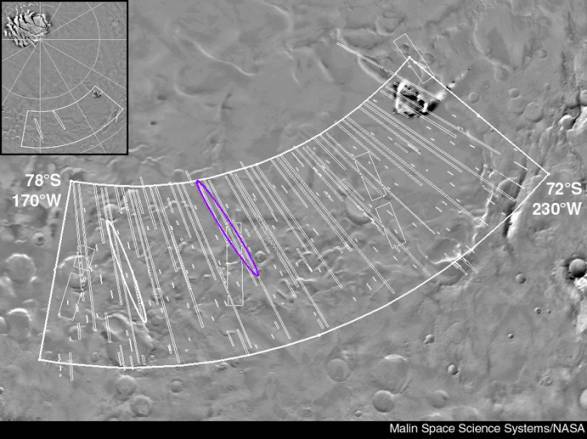 A secondary landing site is shown as a white oval while at the upper left an inset shows the area in relation to the pole. This polar landing region's layered terrain will hopefully allow MPL's instruments to view a record of climate changes in Martian history, like reading tree rings or layers in an ice core. Before landing, MPL will drop off two microprobes intended to penetrate the soil and look for water ice. Mars Polar Lander will also carry a small Mars Microphone.